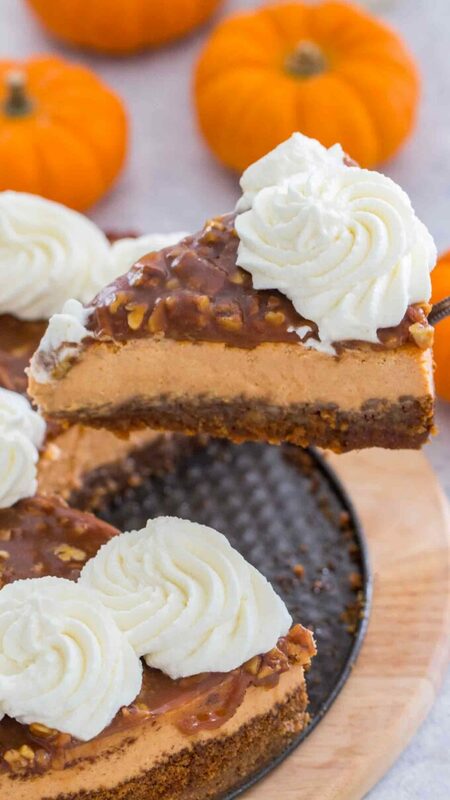 Pecan Pie Pumpkin Cheesecake is the copycat of the famous Cheesecake Factory cheesecake. Pecan pie and pumpkin cheesecake combined into one amazing dessert. Pumpkin Recipes are very popular on the blog, check these layered Pumpkin Cheesecake Bars that have over 6M views on Facebook. Other favorites are this Instant Pot Pumpkin Cheesecake and this Cheesecake Stuffed Pumpkin Bread. 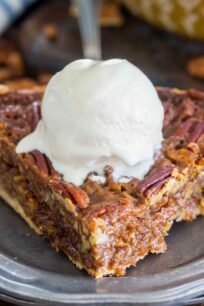 Pecan Pie Pumpkin Cheesecake must be the best dessert that came out of my kitchen. I am on a mission to make all the Cheesecake Factory cakes, and this one is by far my favorite from the menu. Too bad it’s seasonal, but it’s worth every single calorie. 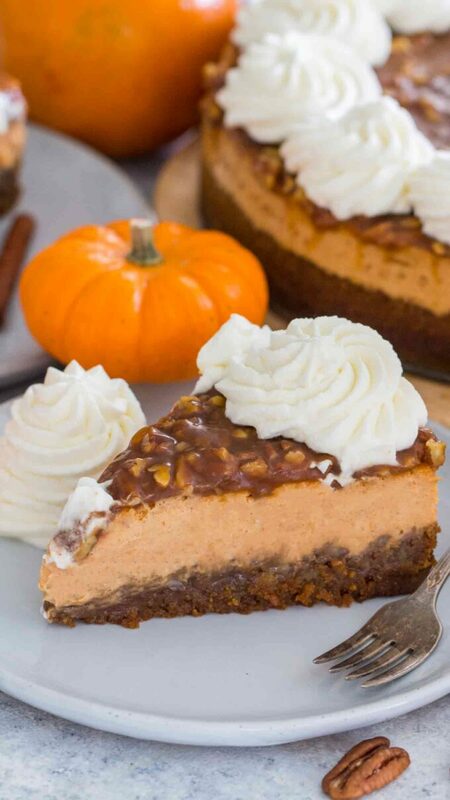 Who said that you have to choose between pecan pie and pumpkin cheesecake when you can have the best of both worlds?! 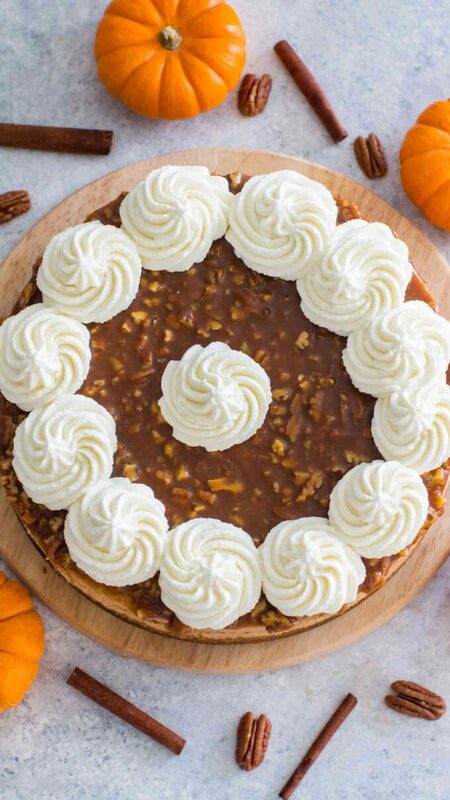 This delicious cake is made of a thick layer of pecan pie filling that has been topped with a luxuriously creamy pumpkin cheesecake. To take it over the top, the cake is finished with a pecan caramel layer and whipped cream. This indulgent dessert is beyond fantastic and while it involves a few steps to make, it is totally worth it. A show stopper and the best way to take your Thanksgiving dessert game to the next level. You should also check my recipe for Cheesecake Factory Original Cheesecake Copycat Recipe, it has lots of tips on how to make the perfect dessert. First, mix brown sugar, cornstarch, and salt. Then, add the mixture to a saucepan over low-medium heat. Next, whisk in egg yolks, dark corn syrup, and cream. Stir and simmer. Fold in chopped roasted pecans. Also, adding flour or/and cornstarch to the batter helps prevent cracks. In addition, avoid opening the door oven while baking the cheesecake, because the shift in temperature can cause cracks. Watch the cake closely to avoid over-baking it. When the sides are puffed and the center of the cake is just slightly wobbly, the cheesecake is done. Cooling the cake in the oven, with the door slightly cracked is also very important because the sudden change in temperature can cause cracks. First, let the cheesecake completely cool and refrigerate for at least 6 hours or per recipe instructions. It needs to be cold to be able to fix the cracks. Next, use the spatula dipped into hot water (or you can use your fingers or a spoon) to gently push and press down in the area of the crack and spread to fill it in until the top is smooth. Lastly, add a thin layer of sour cream topping if the cracks are small or a layer of whipped cream topping. Set the prepared pan in a large roasting pan that is deep enough to add water to it. Then, pour HOT water into the roasting pan, about halfway up the sides of the pan. Next, transfer to a pre-heated oven and bake, until the center jiggles slightly like Jell-O and the sides are puffed and a light golden brown. The residual heat will cook the center of the cheesecake. If it doesn’t wobble a bit in the center, it means it has been over-baked, and most likely will crack. Then, wipe the knife clean and run it under hot water before making another cut, because cheesecake bites will stick to it. An easy, mess-free way to cut even slices is to use cheese wire or unflavored dental floss. This method can be easily used on cheesecakes baked in a springform pan. Clean the bits that stuck to the wire/floss before every cut. You can freeze the cheesecake BEFORE you top it with the caramel topping and whipped cream. If you already topped it, just remove the whipped cream, before freezing. Fold in roasted, chopped pecans and vanilla extract. Transfer the mixture to the prepared graham crust. Bake in the preheated oven at 350F for 20 minutes, reduce heat to 325F and bake for another 30-40 minutes. Transfer cheesecake to a wire rack to cool completely, after which transfer to the fridge for at least six hours before adding the Pecan Caramel Layer. Prepare this layer when ready to add it to the refrigerated cheesecake, as the caramel will harden and it will become impossible to pour it. In a medium sauce pan over medium heat melt sugar while stirring constantly until a brownish liquid forms. All sugar bits should be fully dissolved. Carefully, while still stirring, add the heavy whipping cream, once all the cream has been added let the mixture boil without stirring for one minute. Let the mixture cool slightly, pour it on top of the pumpkin cheesecake. Level the top with a spatula. Return to the fridge for 1 hour. This cheesecake is incredible! Its fantastic! YUM! This looks so delicious! This made me drool. Cannot wait to try this. Thank you for a great recipe! Oh my this looks delightful, my family will love this! WOW!! Such a fantastic cheesecake!! My family would LOVE this!! It’s like you can see into my soul! Pecan pie plus pumpkin cheesecake?! This is a dream come true! 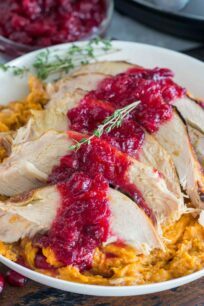 This is a must add to my Thanksgiving menu! Never to early to start planning it out! Where has this been all my life! It’s my three favorite desserts all rolled up into one mega dessert! It’s the Voltron of desserts! Mmm, this dessert looks lovely. I’m definitely in the mood for that pumpkin flavor right about now. This is definitely going to be an option for thanksgiving. The cheesecake tips are helpful too! This looks exactly like the kind of dessert I could go for about now. 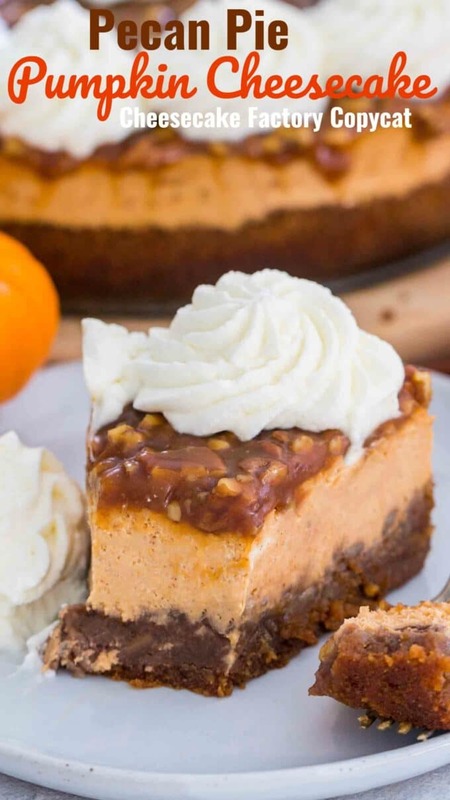 I love the flavors of cheesecake + pumpkin + pecan! Shut UP! This is AMAZING – it’s all of my favorite things about fall, wrapped up into one single dessert. OMG my mouth is DROOLING! OH MY! what a great pairing of two delicious desserts into 1! This looks amazing. I am going to have to try to make it for Thanksgiving. I seriously doubt it will look as nice as yours though. This looks amazing. I am a huge fan of pecans and cheesecake, so I bet this would be perfect. I will have to try making it this Thanksgiving. Wow, looks amazing. My husband would love this, his 2 favorite pies! 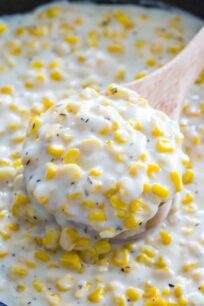 Can this recipe be made ahead of time and frozen? Yes, it can! BUT preferably do not top it with the caramel topping and whipped cream. Add those after you thaw the cheesecake. I provide instructions in the blog post. Hi! 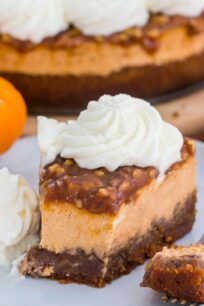 Would it be possible to do the crust and pecan fillin one day, refrigerate and then work on the cheesecake filling the following day? Hi Jennifer, you can do that! Thats the beauty of this recipe, that it can be done in steps. Follow the instructions to make the crust and the pecan filling and refrigerate. Make the cheesecake filling when ready and bake. Hi- this is in the oven right now- on the “cool in oven for 1 hour with door propped open” stage. At what point do you remove the outer ring of the spring form pan? I’m thinking the best time would be after the pecan caramel layer has been poured and hardened. I’m going to let it chill in the fridge overnight tonight. What do you think? Can you use a 9″ springform pan? I made this 4 times now it’s requested at my church all the time they will even buy all the ingredients just for me to make it. It’s so rich and yummy. Thank you for a great recipe. Oh and just a tip: Don’t drool on a photo or think your family will love it. Go make it. I did and I don’t regret it at all. It’s wonderful!!!!!! My husband loves this one. He is abdicated to the Cheesecake Factory one and says this tastes just like it! Thank you for the recipe! Hi Jaci, yes this is one rich and amazing cake, if you love pumpkin this is one of the best recipes you can do. Glad you liked it!